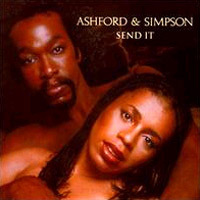 Everyone has their favorite Ashford & Simpson song. Maybe it was Marvin’s, Diana’s, or Jocelyn’s version of “Ain’t No Mountain High Enough”, Marvin & Tammy’s “You’re All I Need to Get By”, Aretha’s “Ain’t Nothing Like The Real Thing”, Diana’s “The Boss”, Ray’s “Let’s Get Stoned”, Chaka’s “Clouds” or “I’m Every Woman”, Quincy’s “Stuff Like That”, Gladys’ “Landlord” or even Stephanie’s “Keep Away Girls.” Of course, Nick and Valerie have had countless gems of their own including “Is It Still Good to Ya”, “Tried, Tested, and Found True”, “Stay Free”, “Nobody Knows”, “It Seems to Hang On”, “Love Don’t Make It Right”, “So, So Satisfied” (one of my favorites), and “Over and Over.” The mighty Nick-O-Val songbook kept spinning out the hits. One of the first concerts I attended was an Ashford & Simpson concert at the Auditorium Theatre in Chicago in 1982. They were sensational and so intertwined in their love and music that you could feel it. I saw them again a couple of years later. One of the most special moments for me was when they visited my church in Chicago in the late 90’s. We did not expect them to sing then Valerie got up and sang a couple verses of the gospel hymn “The Angels Keep Watching Over Me” and I could have just laid out in the floor. She was awesome and gorgeous too! I promise not to stay away so long. Enjoy your music! This entry was posted on Friday, August 6th, 2004 at 12:55 am. It is filed under Flashback Friday and tagged with Ashford & Simpson, Flashback Friday, Nick Ashford, Send It, Valerie Simpson. You can follow any responses to this entry through the RSS 2.0 feed. I occasionally see Nick walking around the upper West Side. I saw them in concert in Syracuse sometime in the mid-80’s. I came over here for a cake fix. When are you baking something else? As a kid, my parents Ashford and Simpson’d me to death! I still love them.